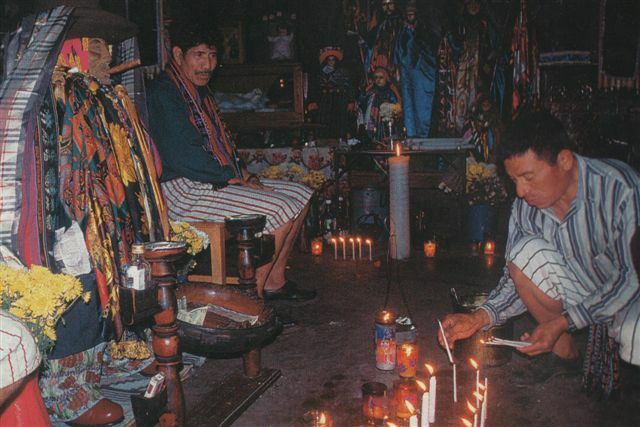 First, I am going to say that in general, Maya spirituality is an inclusive religion rather than exclusive. 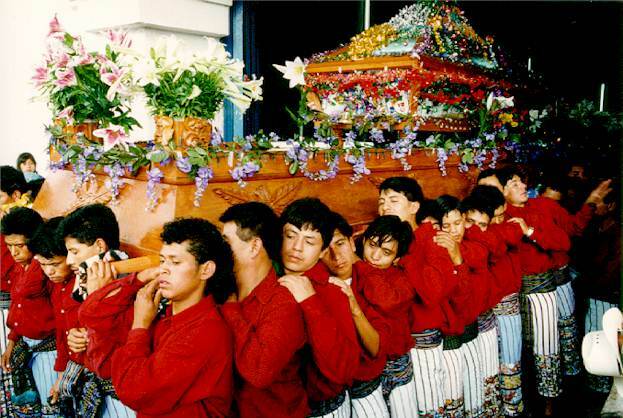 The Maya believe that the spirit of god/being/the creator is within everyone and within everything -mountains, water, air, fire, plants, and even rocks. So, is Maximon religiousness or spirituality? 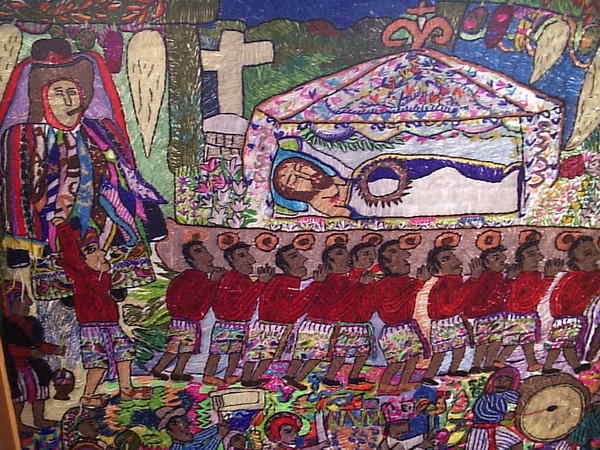 To tell you the truth, I don't know; and, the more I asked, the more I read, the more I thought that I had learned, the more confused I got... so today, I am going to try to describe the way I saw an event that occurs once a year only in Santiago Atitlan. On one side, the annual penitents procession commemorates the crucifixion of Christ. 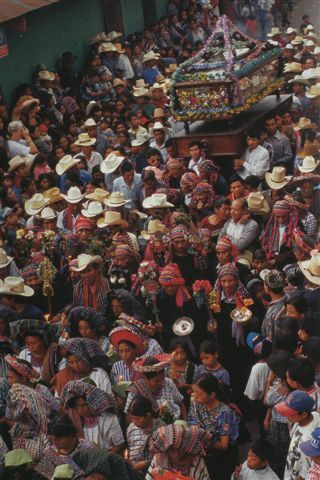 Very early in the morning, approximately 50 young male Atitecos (the gentilitious for the inhabitants of Santiago Atitlan) dressed in their finest traditional attires emerge from the town's 16th century cathedral carrying an immensely heavy wooden float on which rests the Holy Sepulcher containing the symbolic body of Christ. 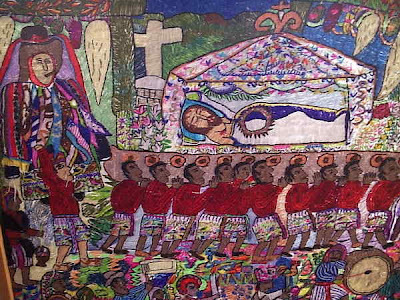 For several hours, they walk very slowly (3 steps forward and 2 steps backwards) through village streets to visit the 4 points of the universe, which in Santiago Atitlan are represented by 4 small chapels. 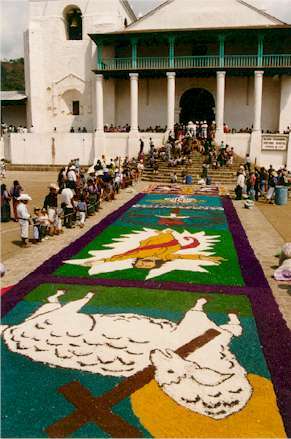 The streets along the processional route, are decorated with vividly colored sawdust and flower petals in the form of long carpets with scenes of the life of Christ and other Catholic imagery. These ephemeral works of art are a collective neighborhood project often not completed until moments before the procession arrives. 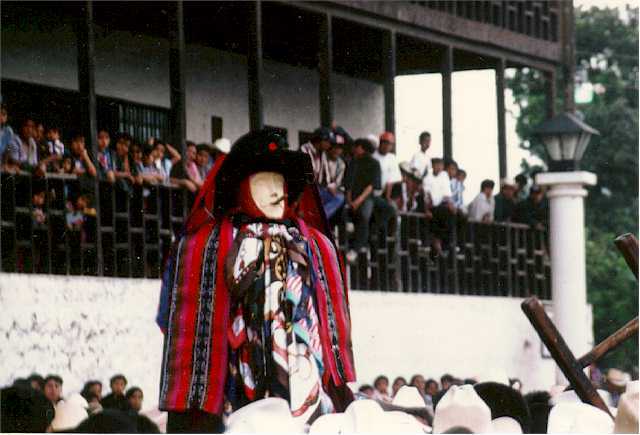 On the other side, around 4 o'clock in the afternoon, when everybody seems to be tired and ready to go home, Maximon, who has been dressed and decorated for the occasion in a ritual that takes almost a week, makes his triumphal entrance carried on the shoulders of his Telinel, a special penitent chosen not only by his merits, but also for his physical strength. 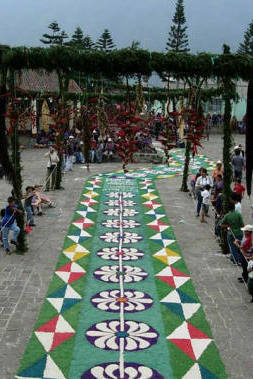 When both processions meet in the middle of the plaza, the Telinel carrying Maximon dances frantically, while several marimba ensembles play at once, hundreds of fireworks are litted up, and the spectators enjoy what it is considered the climax of the celebration and believe me, they celebrate big time! The Ri Laj Mam was angry because due to the new religion, people started disrespecting their traditions and were forgetting to be thankful with mother earth and the Almighty, and to force them to again pay attention to everything that once had been important, he decided to cause very bad things throughout the town. 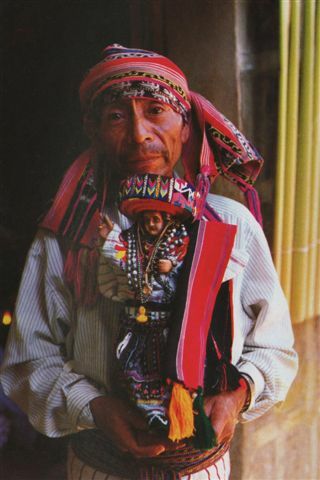 When the Shamanes (Maya priests, also known as Nahuales) understood what was going on, they broke the arms and legs of the statue to control its power to some extent, and then they tied all the pieces together and covered his body with lots of clothes.